Traditional ways of talking to customers, partners, and employees—memos, phone calls, newsletters—are being replaced by web-based interactive and social communication tools. Intranets, partner portals, social media, and especially enterprise social networks are quickly becoming the preferred methods of imparting important messages. In fact, recent ESG research found that 74% of organizations surveyed had already deployed some type of social communication or collaboration tool, including video, as a way to collaborate internally and externally. Mobile computing is an important component of this new collaborative landscape. Mobile workforce enablement is one of the top ten spending priorities for IT reported by respondents to ESG research for 2012, and one of the most important aspects of the Social Enterprise. Of those surveyed, 88% said that mobile access to social communication or collaboration tools was either important or very important. Where people are, when they have time, and the platform they use all affect their ability to hear and understand information as well as communicate and collaborate. Otherwise, they are left out of the conversation, diminishing the benefits of social collaboration. 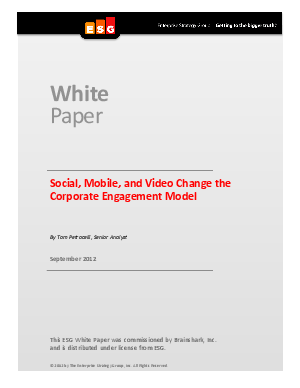 This whitepaper examines how companies can leverage Mobile, Social Enterprise, and video to create an enriched environment that delivers important communications and fosters active, rather than passive, engagement.